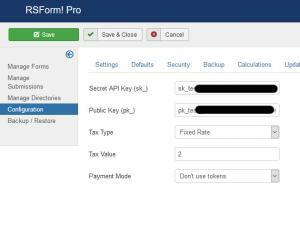 The RSForm!Pro Stripe Payment Integration Plugin allows you to add a new payment method to the existing Payment Package of RSForm!Pro. 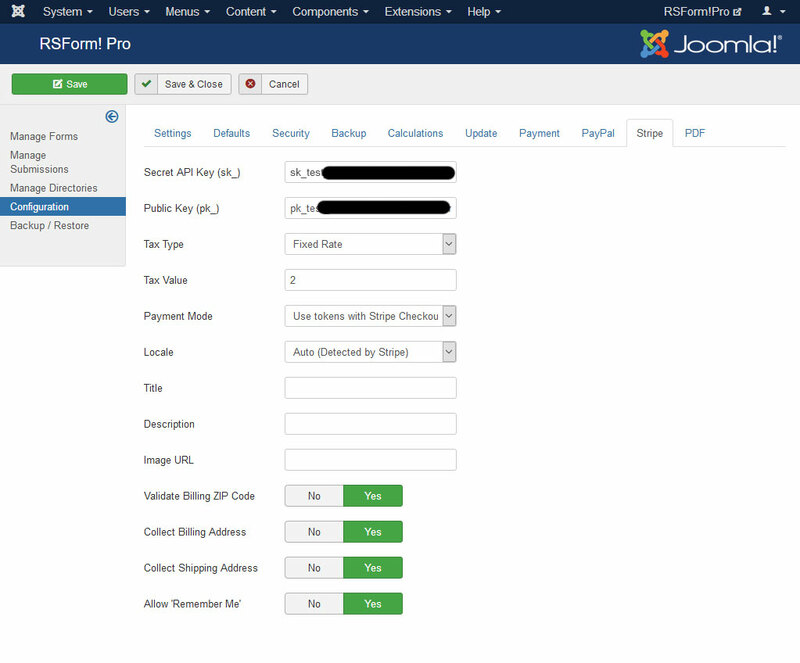 This RSForm!Pro Stripe Payment Integration Plugin is commercial and needs to be purchased separately. The price of the plugin is: 15 EUR. 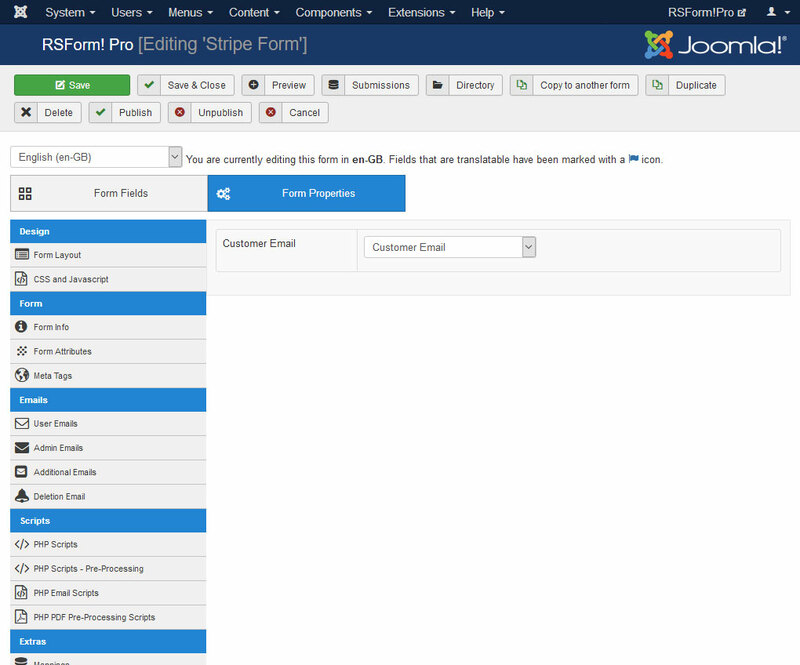 You can download the plugin by logging with your purchase user, then head to Downloads > My Downloads > RSForm!Pro - view all plugins and modules > RSForm!Pro Files > Plugins > "Stripe Plugin for Joomla! 3.x". In the backend area go to the Extensions > Manager > Install page, and install the plugin. Next thing is to publish the plugin from Extensions > Plug-in Manager, search for the "RSForm! 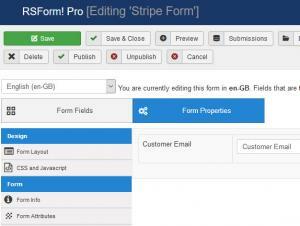 Pro - Stripe" plugin and publish it. Secret API Key (sk_): this should be located in your Stripe account settings (more details). 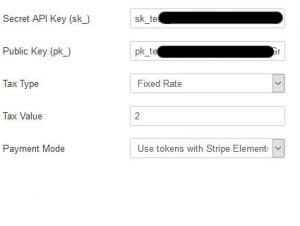 Public Key (pk_): this should be located in your Stripe account settings (more details). When enabled, this will include the Stripe js library which replaces your credit card fields with Stripe fields, sending all credit card data directly to Stripe instead of passing it through your server. 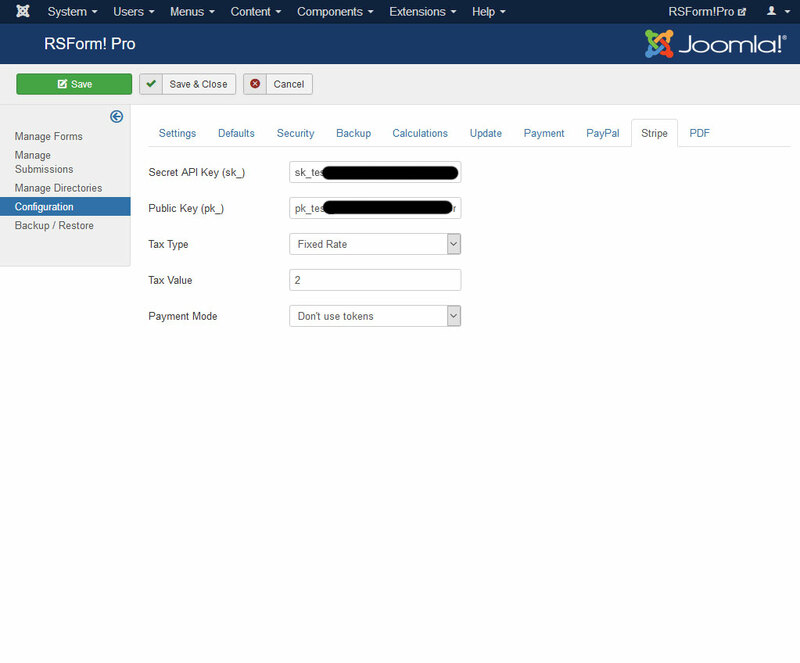 Locale: Auto (Detected by Stripe) / Site (Joomla! language). The payment window will be displayed in the user's preferred language, if there is any available. By default, English will be used. Title: Type here the title that will be displayed in the payment window. Description: Add the description that will be displayed along with the title, in the payment window. Validate Billing ZIP Code:Yes / No. If enabled, the billing ZIP code will be validated. Collect Billing Address:Yes / No. Specify whether the billing address should be collected in the payment window. Collect Billing Address:Yes / No. 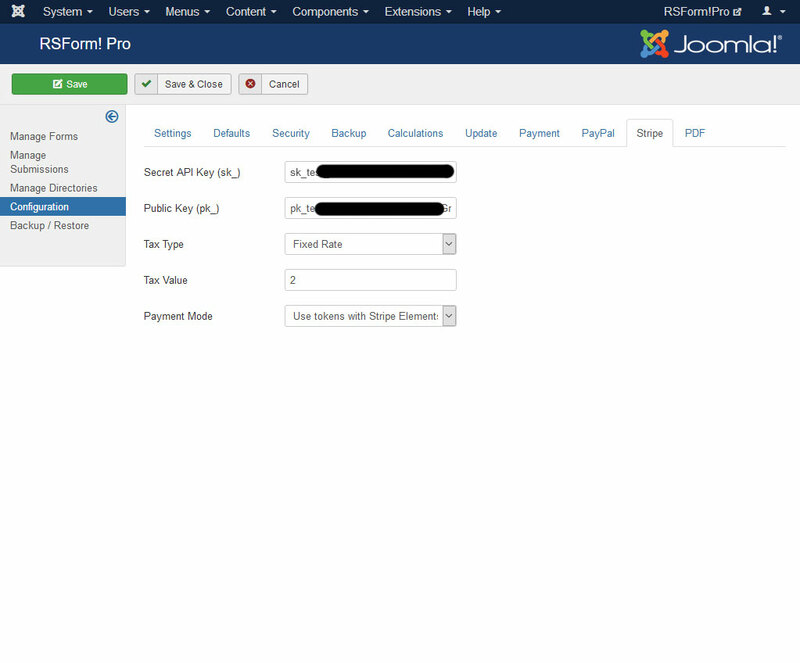 By enabling this option, the billing address will be collected in the payment window. Allow 'Remember Me':Yes / No. Include the option to remember you for future purchases by setting this option to Yes. Cancel URL:Type here the URL where the customer will be directed to if they decide to go back to your website. Leave this blank to default to the form page. The payment details will only be sent to the Stripe payment processor if the user selects Stripe from the "Choose Payment" field before submitting the form. 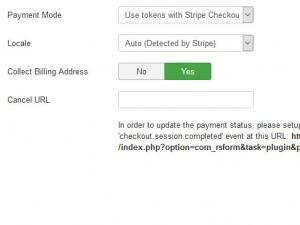 In order the Stripe payment method to be available within the Choose payment field, the following payment related element has to be part of your form. (Payment) Stripe - actual payment related element that will be included within the Choose Payment selection on your form. When using Use tokens with Stripe Checkout (Legacy) / Use tokens with Stripe Checkout (New), only the Customer Email field needs to be mapped. 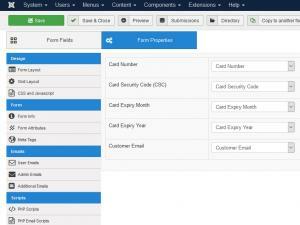 Note: After adding the above-mentioned fields to the form, you need to go to Form Properties > Stripe Configuration tab and map the Stripe fields with the RSForm!Pro fields, in order to be populated automatically with user-supplied data. These fields requires mapping when No Tokens are used or when using Tokens with Stripe Elements. 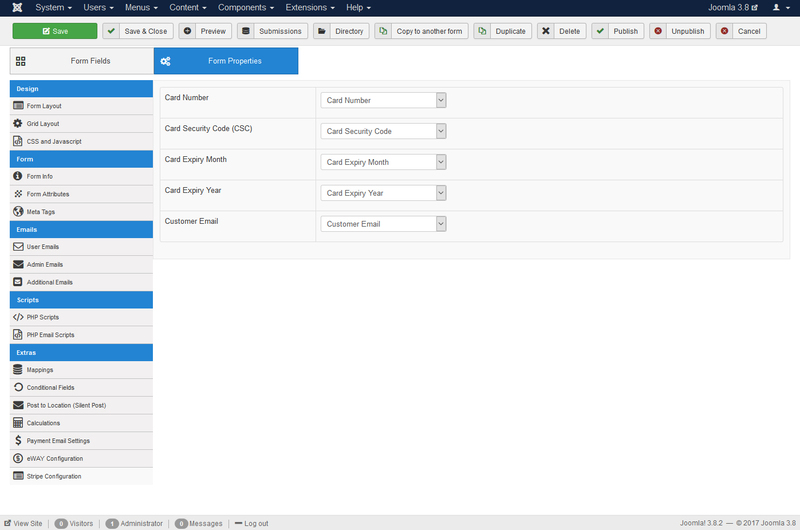 ... form information mapping for Card elements will no longer be required, except for the 'Customer Email' field. Note: when testing Stripe, besides the fact that you'll need a testing Stripe API Key, you'll have to use a testing credit card. 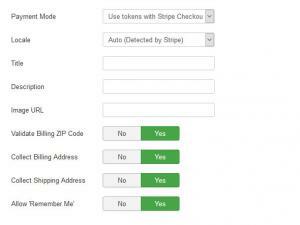 Then you can override parameters as follows, depending on your Stripe payment mode. 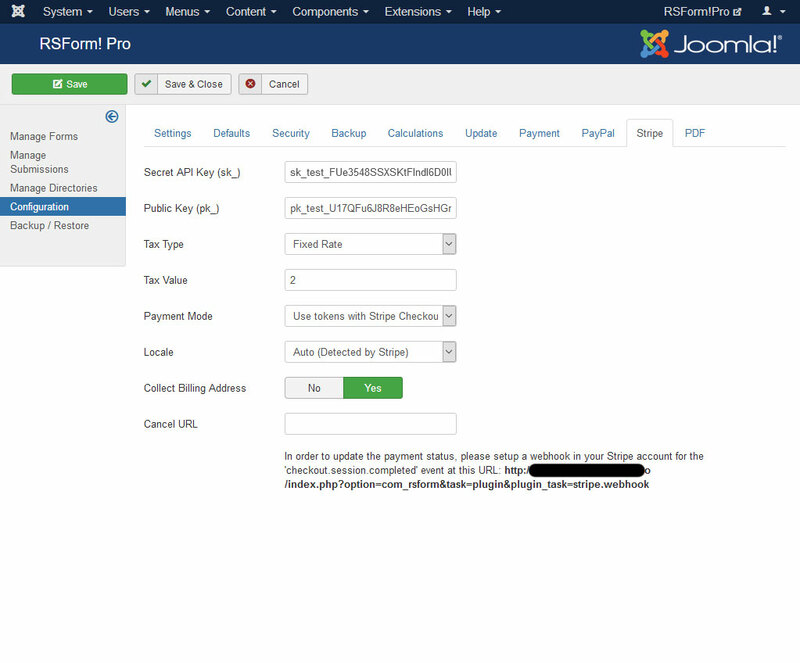 //another example using the metadata parameter where you can add custom [token => value] to your payment. //in this example, "first name" or "last name" can be anything you want. The above examples will change the description sent to the payment processor, or add some extra information. For a more detailed list of parameters available in the API you can check the developer documentation: Stripe Elements / Checkout Legacy or Stripe Checkout New.